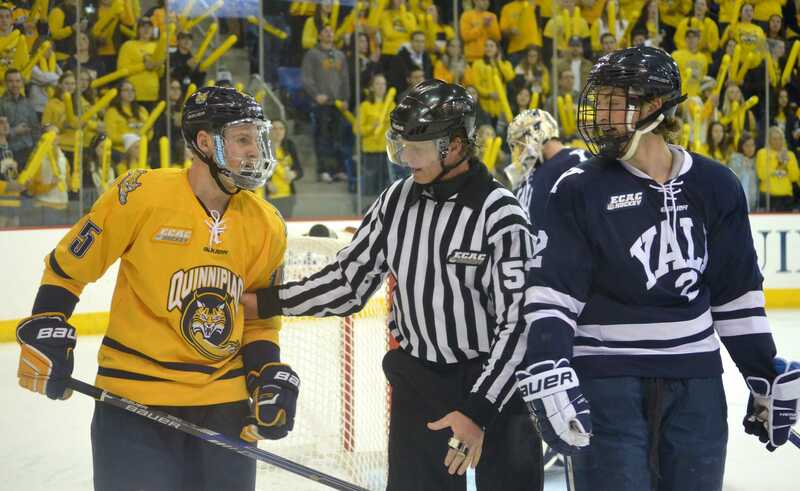 On Feb. 4 at Ingalls Rink in New Haven, Quinnipiac men’s ice hockey took the first of two games in the “Battle of Whitney Ave.” by beating rival Yale, 5-2. Tonight, the Bobcats take on the Bulldogs at home in another ECAC rivalry game. Historically, the Bobcats have gotten the better of the Bulldogs. Quinnipiac is 15-6-5 in the all-time series against Yale and 10-1-3 in their last 14 matchups. Yale’s lone win over that span came in the 2013 NCAA National Championship Game. The Bobcats have also won four straight Heroes Hats Games while the Bulldogs have won just two in series history. Yale has only claimed one win at High Point Solutions Arena in Heroes Hat history by crushing Quinnipiac, 6-1, on Feb. 18, 2011. Quinnipiac won last year’s game, 4-1, in the regular season finale on Feb. 27, 2016, behind four different goal scorers. On Friday night, the Bobcats will play in their final regular season “Battle of Whitney Ave.” with high-stakes on the line. Both Quinnipiac (11-8-1, 23 points in ECAC) and Yale (7-9-4, 21 points in ECAC) have two conference games left in the regular season. While winning the conference is mathematically out of reach for both teams at this point, every win means a higher seed in the conference. Currently, Quinnipiac sits in 5th place and 3 points back from 4th place St. Lawrence, while Yale is in 7th. In order to avoid an extra weekend of “play-in” first round action, the Bobcats will have to climb up to 4th place in the ECAC to ensure a first round “bye”. Quinnipiac may not be the No. 1 powerhouse it was last season, but in terms of making a late push for the Whitelaw Cup, the award given to the ECAC Champion with an automatic bid to the NCAA Tournament, this weekend is immensely important. And it all starts on the most-anticipated Friday night of the season at High Point Solutions Arena against the Yale Bulldogs.